Secluded from the lively town and other resorts, a wedding at one of the Sandy Point Resorts is an ideal choice for those desiring to say "I Do." You’ll treasure the ambience of a beach wedding ceremony with the panoramic view of the turquoise Caribbean Sea, amidst coconut palms and beautiful tropical flowers. Whether you are looking for an intimate, beachfront wedding ceremony or an extravagant affair, our dedicated onsite wedding coordinator and creative team will help you plan and coordinate every detail of your beach wedding and turn your dreams into reality. 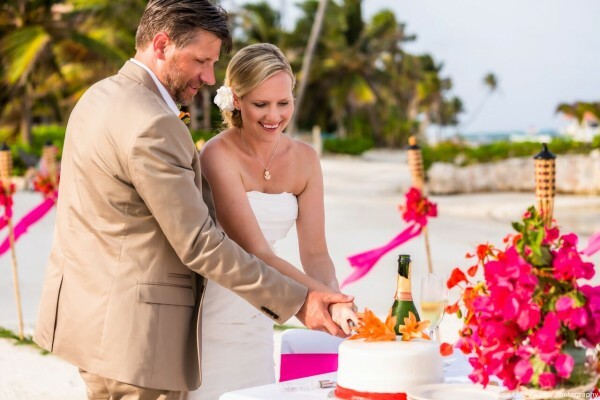 Sandy Point Resorts offers great locations for Beach Weddings, Destination Weddings, Vow Renewals and Tropical Beach Wedding Ceremonies in San Pedro, Ambergris Caye. Everything you need to make your dream wedding stress-less and hassle-free! We offer great resorts for Beach Weddings, Destination Weddings and Tropical Beach Wedding Ceremonies on Ambergris Caye. Choose from our standard Belize Wedding Packages or speak with our professional wedding coordinators and have them customize one for you. Get in touch with us to start planning your dream wedding!